Morton Feldman: Out of "Last Pieces"
Here's another release in the "Bernstein Century" series that brings together material that is new to CD. These performances appeared on three separate LPs that were recorded in 1961, 1964, and 1967. Annotator Tim Page admits in his booklet note that avant-garde music wasn't necessarily Leonard Bernstein's forte. In spite of his reputation of being a chic advocate of all things youthful, his recorded legacy, impressive as it is, is also rather conventional. Still, there's much to enjoy on this CD. The most successful performances here are the Feldman and the Schuller. Although Out of "Last Pieces" is neither typical of Morton Feldman nor even a particularly strong work, Bernstein solves its coloristic equations, and the New York Philharmonic makes sensuous music out of it. Composer Gunther Schuller recommends that those hearing Triplum focus not on its threes-based structure but on its totality. This is the best work I've heard from Schuller by far; too much of his music seems to be intent on proving some obscure thesis. Bernstein and Schuller were Tanglewood colleagues, and Bernstein's recording of Triplum shows more than just dutiful involvement from the conductor. Ligeti's Atmosphères took off when Stanley Kubrick incorporated it into 2001: A Space Odyssey. Bernstein's recording actually predates that film, so nobody can accuse him of opportunism. Less music than organized sound, Atmosphères (1961) is one of the towering masterpieces of modern classical music. Bernstein dispatches it in 6:52, a full 100 seconds faster than the next fastest recording in my collection. The effect is a little insensitive. Next to Atmosphères, Denisov's piece is negligible, and the four short improvisations by the orchestra are, well, strange. Actually, they're not bad music, but I question how "improvisational" they really were, given the organization of the music. Even Tim Page dismisses them. The disc ends with Messiaen's Trois petites liturgies de la Présence Divine, a work for orchestra, ondes martenot (here, John Canarina), piano (Paul Jacobs), and unison sopranos (women from the Choral Arts Society). In an interesting collision between composer and performer, Bernstein treats Messiaen's idiosyncratic yet devout musical language with what sounds suspiciously like irony. His interpretation is desiccating, and in the third movement, the women's chorus performs the parlando sections coarsely, as if they were selling fish. One feels the negative effect of not having a performance tradition – more recent recordings of this work are far more sensible. This is one of the wackiest Messiaen recordings on the market. The recording quality is variable but always at least good. Ungenerously, there are no texts included for the Messiaen. 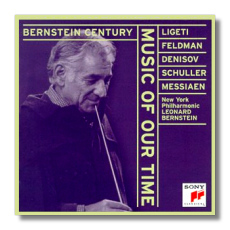 This CD shows a side of Bernstein that often remained hidden. For that, at least, it is worth hearing. I hope that Sony intends to reissue the Lukas Foss Phorion that was included on one of the original LPs.